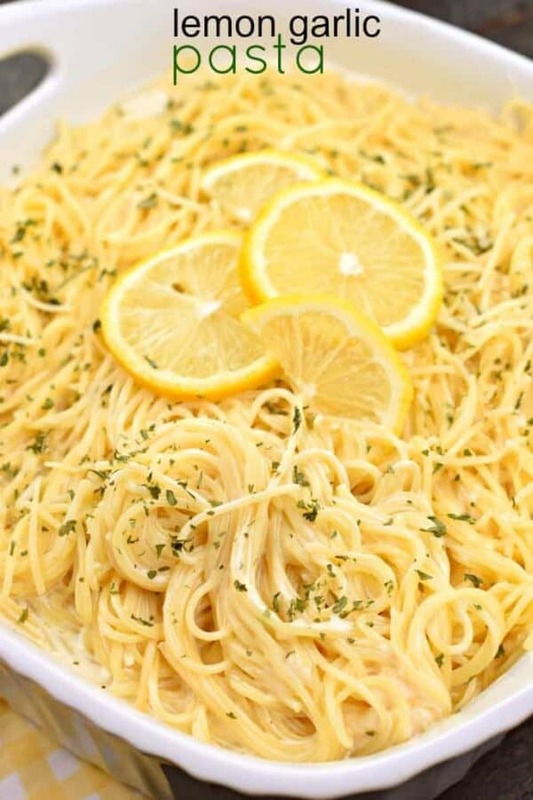 You’ll love this tangy, Lemon Garlic Pasta as a side dish with your favorite chicken or fish! Or enjoy it as your main entree in under 30 minutes! 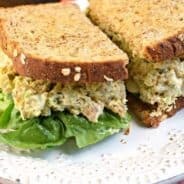 I’m on the hunt for easy, delicious recipes that can be used for both vegetarians and carnivores! Today’s Lemon Garlic Pasta did NOT disappoint. It’s creamy (almost like an alfredo), but it’s packed with flavor! It is enjoyable on it’s own, or serve it with some grilled chicken or fish. This Parmesan Crusted Tilapia is how I served it up! That way, my daughter who is vegetarian can enjoy the pasta…and the rest of us enjoyed it with some fish (remember I’m pescetarian right now, which means I can eat seafood). This also would make a great side dish for your Easter Ham dinner! Use a big skillet to make the sauce in. Then, when the pasta is done cooking, you can pop it all into the skillet and serve from there! My favorite skillet is a 12 inch Stainless Steel version, so fantastic for so many recipes! If you don’t have vegetable stock (and you’re not a vegetarian), chicken stock works great in this recipe as well! You can also serve with chicken instead of fish. Use a good parmesan cheese, preferably shredded (not grated). The tanginess of the cheese really shines in this pasta dish. To add more or less “heat” adjust the amount of red pepper flakes. My family likes just a pinch, but if you enjoy things a bit spicier, add more! When I’m out of fresh garlic, I always have a jar of chopped garlic in my refrigerator. Perfect in a recipe like this one. If you’re using the garlic from a jar, you’ll need about 2 tsp to equal 4 cloves of fresh garlic. Be sure to check out my Cajun Sausage Pasta recipe! Especially if you like spicy cajun food! 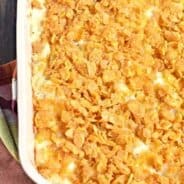 My recipe for Italian Chicken Casserole is always a huge hit when I bring it to potlucks. Even the kids love it! 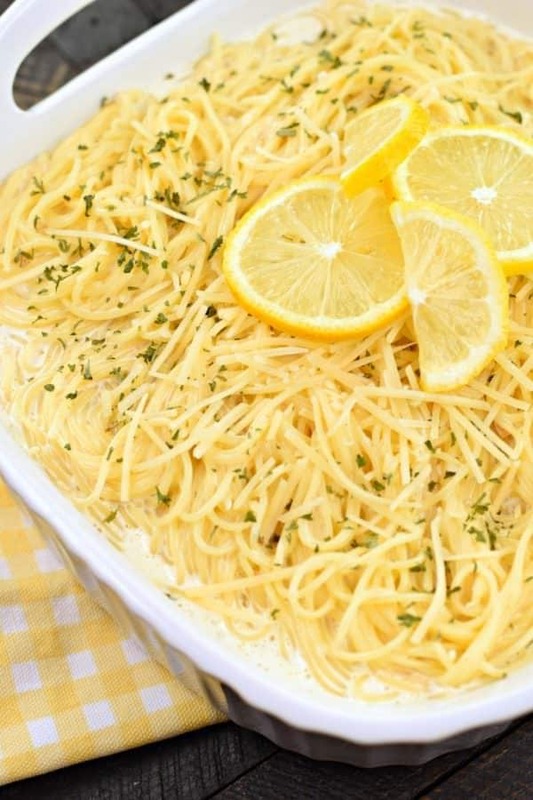 You'll love this tangy, Lemon Garlic Pasta as a side dish with your favorite chicken or fish! Or enjoy it as your main entree! In large skillet on low heat, add oil, garlic and red pepper flakes. Heat for several minutes, add lemon juice, vegetable broth and heavy cream. Allow to heat thoroughly, about 10-15 minutes. Remove from heat. Season with salt and pepper. Add parmesan cheese and allow to melt. Add cooked pasta, mix sauce thoroughly to coat the pasta. Sprinkle with parsley, if desired. Enjoy! 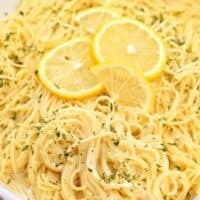 **This creamy Lemon Garlic Pasta recipe was first published on January 28, 2011 and has been updated with new images and content on March 29, 2018. This sounds great. I’ve pinned it, so I remember to try it. I make this as a quick lunch, but I don’t always have heavy cream so I will use canned milk and a wee tuoch of cornstarch for a bit of thickener. But I am a garlaholic, for each 4 ounces of pasta I will use a large clove of garlic. 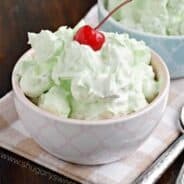 I would love to find out how to make a garlic dessert and I do believe my life would be complete. I keep a quart jar of the chopped garlic. I roast 2-3 whole heads weekly and use 2 fresh heads per week also. I tell ya I use it in everything, if vampires attack, well my family will live unphased lol. This was amazing and easy to make! The flavors from the lemon and garlic and a little bit of heat were perfect. It was absolutely delicious! 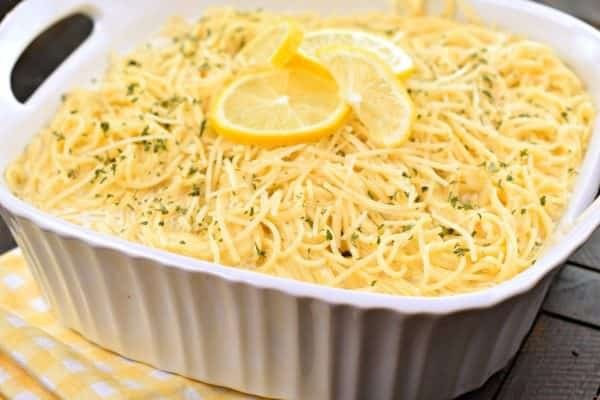 I plan to make for a large party as one of my entrees, however I’m a bit concerned the angel hair pasta will get sticky and clump in the chafing rack — but still want to serve this dish. Any recommendations are welcomed! I would ideally like to make the sauce the night before and prepare the pasta that day. I think I will make extra sauce to have on hand in case I need to heat up and combine with pasta as the party continues. All my favorite flavors in one dish – LOVE this recipe! wow, that’s great, this cake is delicious. I have made this before and it was DELICIOUS! However, since then we learned that my hubs has Crohn’s and has to forgo dairy. If I used an almond or coconut milk, how can I make it thicker? Thanks!